For the 1970s Dutch singer Monica, see Monica Verschoor. Monica also ventured into acting, with a supporting role in Boys and Girls (2000), and starring roles in television film Love Song (2000). During the production of her third album, All Eyez on Me (2002), Monica experienced personal struggles and her career went under hiatus. 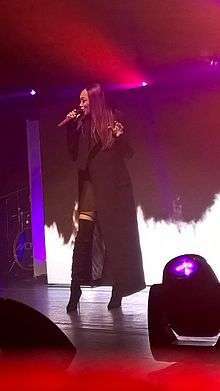 In 2003, her fourth album, After the Storm, was released, and after an unsuccessful period, she scored her fifth number one single on the US R&B/Hip Hop, "So Gone". The album also included her Top 20 Billboard Hot 100 hit "U Should've Known Better". Her sixth album, Still Standing, which recording was tracked by her BET reality show Monica: Still Standing, was released in 2010 and produced the hit single "Everything to Me", which became her sixth number one hit on the US R&B/Hip Hop. Monica was born in College Park, Georgia on October 24, 1980. She is the only daughter of Marilyn Best, a former church singer and Delta Air Lines customer service representative, and M.C. "Billy" Arnold Jr., a mechanic working for an Atlanta freight company. She has a younger brother, Montez (born in 1983), half brother Jermond Grant on her father's side, and two maternal half-brothers, Tron and Cypress. Monica also is a cousin of record producer Polow da Don, and relative-in-law to rapper Ludacris through her mother's second marriage to Reverend Edward Best, a Methodist minister. After a label change to Clive Davis's Arista Records, Monica mainstream success was boosted, when Diane Warren-written "For You I Will", from the Space Jam soundtrack, became her next top ten pop hit. The following year she was asked to team up with singer Brandy and producer Rodney "Darkchild" Jerkins to record "The Boy Is Mine", the first single from both of their second albums. Released in May 1998, surrounding highly publicized rumors about a real-life catfight between both singers, the duet became both the biggest hit of the summer and the biggest hit of 1998 in general in America, spending record-breaking thirteen weeks on top of the Billboard Hot 100 chart. It earned the pair a Grammy Award for Best R&B Performance by a Duo or Group with Vocal" and garnered multi-platinum sales (to date, it remains as one of the top twenty most successful American singles in history based on Billboard chart success). Jermaine Dupri, David Foster and Austin consulted on the album The Boy Is Mine, which was released later that year and eventually became Monica’s biggest-selling album, becoming certified triple platinum by the RIAA for more than three million store-shipped copies. It yielded another two U.S. number-one hits with "The First Night" and "Angel of Mine", a cover of Eternal's 1997 single, as well as a remake of Richard Marx' "Right Here Waiting". Rolling Stone proclaimed it as "closer to soul's source... harking back past hip-hop songbirds like Mary J. Blige and adult-contemporary sirens like Toni Braxton," while AllMusic called the album an "irresistible sounding [and] immaculately crafted musical backdrop [...] as good as mainstream urban R&B gets in 1998." Monica has also made guest appearances on several television shows such as Living Single (1996), Beverly Hills, 90210 (1997, 1999). In 2012, Monica began work on her eighth studio album. Yet untitled, Monica announced that she would be teaming with producers Missy Elliott, Rico Love, Jim Jonsin, Stargate, Mike WiLL Made It, Miguel, Polow Da Don, and Red Styles on the album. On May 12, 2013, it was announced that she and husband NBA player Shannon Brown were expecting their first child together. She gave birth to their daughter on September 3, 2013. In October 2013, Monica appeared on the soundtrack of Malcolm D. Lee's Christmas comedy-drama The Best Man Holiday with her rendition of "Have Yourself a Merry Little Christmas." On July 29, 2014, Monica premiered a snippet of a Missy Elliott–produced song, nicknamed "I Love Him", via her official Instagram account. Additionally, Monica revealed she would be working with Elliott's childhood friend Timbaland and protégée Jazmine Sullivan. Code Red was released on December 18, 2015. Monica's career came to a slow down in 1999 due to relationship problems with her ex-boyfriend Jarvis Weems. In July 2000, the couple were together at the graveside of Weems's brother, who had died in an automobile accident at age 25 in 1998, when Weems, without warning, put a gun to his head and committed suicide. "Afterward, I felt, 'What else could I have done?' You replay that situation over and over and you switch it around: Maybe if I had said this, or if I would have done that,'" she said in an interview with the The Cincinnati Enquirer the following year. "It's just something that it's never possible for me to go back and change." Monica met rapper Rodney "Rocko" Hill, a former SWA officer and real estate manager, shortly after her ex-boyfriend Jarvis Weems's suicide in 2000, a time which she described as her "weakest." While the couple soon began dating in fall of the same year, they ended their relationship in 2004. A few months later, Monica and Hill revived their relationship and she became pregnant with their first child. On May 21, 2005, she gave birth to their first son. Monica and Hill became engaged once again on Christmas Eve 2007, just a few days prior to the birth of their second child on January 8, 2008. The son was named Romelo Montez Hill, named after Monica's younger brother. The two later parted ways. In June 2010, Monica met NBA player Shannon Brown when looking for someone to play the love interest in her video for "Love All Over Me". Monica later announced her engagement to Brown via her Twitter account, posting a photo of a rose-cut diamond ring. On November 22, 2010, the couple married in a secret ceremony at their Los Angeles home. The marriage, however, did not become a matter of public record until January 21, 2011, when Brown told the Hip-Hop Non-Stop TV-Show. They had a second wedding ceremony for family and friends in July 2011. On September 3, 2013, Monica gave birth to her third child. ↑ Bush, John. "Monica: Biography". AllMusic. MSN. Retrieved 2008-07-18. ↑ "Report: Monica and NBA's Shannon Brown Married Since November". EURweb.com. January 19, 2011. Retrieved October 8, 2013. 1 2 Trust, Gary (January 28, 2010). "Ask Billboard: As Years Go By". Billboard. Retrieved 2010-10-02. 1 2 3 4 5 6 7 8 Mumbi Moody, Nekesa (June 27, 2003). "Monica Triumphs Over Tragedy After the Storm". Enquirer. Retrieved 2007-06-01. ↑ "Monica @ Billboard". Billboard. Retrieved 2010-02-06. ↑ Trust, Gary (August 10, 2010). "Ask Billboard: Olympics, Monica, Smokey Robinson". Billboard. Retrieved 2010-09-22. ↑ "The Top 50 R&B/Hip-Hop Artists of the Past 25 Years". Billboard. November 18, 2010. Retrieved 2010-01-29. ↑ Seymour, Craig (October 1, 2002). "Monica – Pain Is Love". Vibe. Google Books. Retrieved 2010-06-19. 1 2 Dougherty, Steve (July 14, 2003). "Life After Death". People. Retrieved 2010-06-19. 1 2 Starling, Kelly (August 1, 2000). "Monica On Growing Up & The Pregnancy Rumors". Ebony. FindArticles.com. Retrieved 2010-06-19. ↑ "Polow Da Don's Surprise Gift for Monica". Rap-Up. April 9, 2010. Retrieved 2010-06-19. 1 2 "Exclusive Interview With Monica". ConcreteLoop.com. September 5, 2006. Retrieved 2010-06-19. 1 2 Ewey, Melissa (September 1, 1998). "Monica: Miss Thang Grows Up". Ebony. FindArticles.com. Retrieved 2010-10-22. 1 2 Basham, David (March 14, 2002). "Got Charts? The Long Road To #1 — And Those Who Rocked It". MTV News. Retrieved 2010-03-24. ↑ Bland, Bridget (October 25, 2009). "Monica: Still Standing With New BET Reality Show And Forthcoming Music". Entertainment Newsire. Retrieved 2010-04-03. 1 2 Nero, Mark Edward. "Artist Bio: R&B Singer Monica". About.com Guide. Retrieved 2007-06-02. 1 2 "RIAA – Gold & Platinum – Searchable Database". Recording Industry Association of America. Retrieved 2011-01-28. ↑ "The Boy Is Mine album review". Rolling Stone. Retrieved 2007-06-02. ↑ Erlewine, Stephen Thomas. "Review: The Boy Is Mine – Monica". AllMusic. Retrieved 2007-06-02. ↑ Wiederhorn, Jon (March 31, 2003). "Missy, DMX, Tyrese To Give Monica's New LP Extra Oomph". MTV News. VH1.com. Retrieved 2011-01-28. ↑ Kellman, Andy. "Review: After the Storm – Monica". AllMusic. Retrieved 2007-05-31. ↑ "Chart Beat Bonus: Gone Good to Go". Billboard. June 20, 2003. Retrieved 2008-07-31. ↑ "U Should've Known Better". A-Charts. Retrieved 2008-08-10. ↑ Rodriguez, Jayson (September 8, 2006). "Monica Overcomes Pregnancy Rumors, Ex-Boyfriend's Suicide To Form Makings of Me". MTV News. VH1.com. Retrieved 2007-05-28. ↑ Kellman, Andy. "Review: The Makings of Me – Monica". AllMusic. Retrieved 2007-05-28. ↑ Dombal, Ryan (September 29, 2008). "The Makings of Me review". Entertainment Weekly. Retrieved 2007-05-28. ↑ Trust, Gary (August 10, 2010). "Ask Billboard: As Years Go By". Billboard. Retrieved 2010-09-22. ↑ St. Fleur, Patrick (March 16, 2010). "Monica Interview: Still Living, Still Strong, Still Standing". WordofSouth.com. Retrieved 2010-04-03. ↑ Crosley, Hillary (December 15, 2008). "Monica Gets Busy On Sixth Album". Billboard. Retrieved 2008-12-17. ↑ "Artist Chart History – Keyshia Cole". Billboard. Nielsen Business Media. Retrieved 2009-05-08. ↑ Seidman, Robert (October 28, 2009). "2009 BET Hip Hop Awards And The Series Premiere Of Monica: Still Standing Bring In Big Numbers". TVByTheNumbers.com. Retrieved 2010-11-25. ↑ "Tonight's Best On TV". Entertainment Weekly. EW.com. November 21, 2010. Retrieved 2010-11-25. ↑ Wood, Mikael (March 17, 2010). "Still Standing review". Entertainment Weekly. Retrieved 2011-01-28. ↑ "Monica's Still Standing Certified Gold". ThatGrapeJuice. April 22, 2010. Retrieved 2010-06-19. ↑ "Exclusive Q&A: Monica Reacts to Grammy Nominations". Rap-Up.com. December 1, 2010. Retrieved 2010-12-03. ↑ Hope, Clover (2010-03-22). "Monica Addresses Rocko Breakup, Cheating Rumors: 'I Never Felt So Confused'". Vibe. Retrieved 2010-06-19. 1 2 "Video: Monica – Love All Over Me". Rap-Up. 2011-01-29. Retrieved 2010-07-15. ↑ "LA Lakers Shannon Brown Secretly Weds R&B Singer Monica". New York Post. January 21, 2011. Retrieved 2011-01-21. ↑ Eggenberger, Nicole (2011-01-29). "Monica Shares Shannon Brown Engagement News?". OK!. Retrieved 2011-01-21. ↑ Thomas, Rebecca (September 17, 2010). "Trey Songz Makes Audience Swoon On NYC Tour Stop". MTV News. MTV.com. Retrieved 2010-09-22. ↑ Scarpa, Gina (May 2, 2011). "Monica Joins NBC's "The Voice"". Vibe. Vibe.com. Retrieved 2012-11-07. ↑ "Rap-Up TV Interviews Monica: Part I". Rap-Up.com. September 20, 2010. Retrieved 2010-09-22. ↑ Scarpa, Gina (December 15, 2010). "The Voice: Exclusive Interview With Monica". RealityWanted.com. Retrieved 2011-05-31. ↑ "New Life Reviews, Ratings, Credits, and More at Metacritic". Metacritic. CBS Interactive. Retrieved 2012-04-10. ↑ Collar, Matt. "New Life – Monica". AllMusic. Rovi Corporation. Review. Retrieved 2012-04-10. ↑ Markovitz, Adam (April 10, 2012). "New Live review – Monica Review". Entertainment Weekly. Time Inc. (1202). Retrieved 2012-04-10. ↑ "Rap-Up TV: Monica Talks Album Sales, New Single 'Without You'". Rap-Up. April 20, 2012. Retrieved 2012-11-06. ↑ "Brandy and Monica Duet 'It All Belongs to Me' Due Next Month". Rap-Up.com. January 17, 2012. Retrieved 2012-02-05. ↑ "2013 Christian Grammy winners". Christian Today. Andrew Clark. February 11, 2013. Retrieved 2013-05-15. ↑ "Monica Preps New Album with Big Name Producers". Rap-Up.com. October 10, 2012. Retrieved 2013-01-06. ↑ Eggenberger, Nicole (2013-09-06). "Monica, Shannon Brown Welcome Baby Girl Laiyah: First Photo!". Us Weekly. Retrieved 2013-10-21. ↑ The Best Man Holiday (liner notes). Various Arists. RCA Records. 2013. ↑ Barnett, Vanessa (29 July 2014). "Monica and Missy Elliott Reunite in the Studio". HipHollywood. HipHollywood.com. Retrieved 3 August 2014. ↑ "Monica Readies 'Code Red' for December". Rap-Up.com. November 2, 2015. Retrieved November 2, 2015. 1 2 Checkoway, Laura (October 1, 2006). Through The Fire. Vibe. Google Books. Retrieved 2010-06-19. ↑ "Monica Welcomes Second Son". EURweb.com. January 9, 2008. Retrieved 2010-06-19. ↑ Hensel, Amanda (2011-01-29). "Monica Engaged to Shannon Brown". AOL Music. Retrieved 2010-10-18. ↑ "LA Lakers Shannon Brown Secretly Weds R&B Singer Monica". New York Post. 2011-01-21. Retrieved 2011-01-21. ↑ "Monica marries again in 'lavish' ceremony – The Marquee Blog – CNN.com Blogs". Marquee.blogs.cnn.com. Retrieved 2014-07-30. ↑ Eggenberger, Nicole (September 6, 2013). "Monica and Shannon Brown Welcome Baby Girl". Usweekly.com. Retrieved December 3, 2016.